Whether you’re interested in Norfolk’s maritime heritage, medieval treasures in the archives or the history of Eccles church, there’s something for your group on the talks list. Our speakers are either trustees of NORAH or volunteers offering their time to NORAH. Furthermore, they are experts in their field of interest and are wanting to share and engage with anyone interested in Norfolk’s past. In September 2017, NORAH trustee David Stannard delivered an evening talk to the Friends of Cromer Museum. Spoyl’d by the Rage of the Sea, was a brief history of North Sea storms and their devastating effects. The talk concluded with a review of the many organisations and institutions created by coastal communities to mitigate the impact of these events. David’s interest in this subject is linked to his research into the history of Eccles next the Sea and its relationship to the sea. NORAH was delighted to receive the continued support from the Friends of Cromer Museum and to work with them to promote Norfolk’s heritage. All speakers on the register give their time for free, but ask for a donation to be made to support the work of NORAH. For more details about the Talks and Speakers Register, or to request a talk, please see the NORAH website. There are many archives which record the impact of storms on Norfolk’s coast. 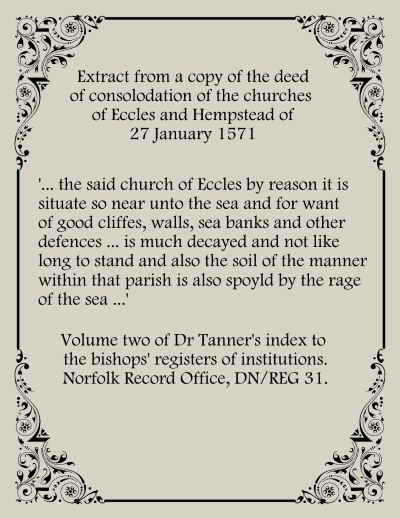 This extract is from the first parish register of baptisms, marriages and burials for Wells-next-the-Sea. 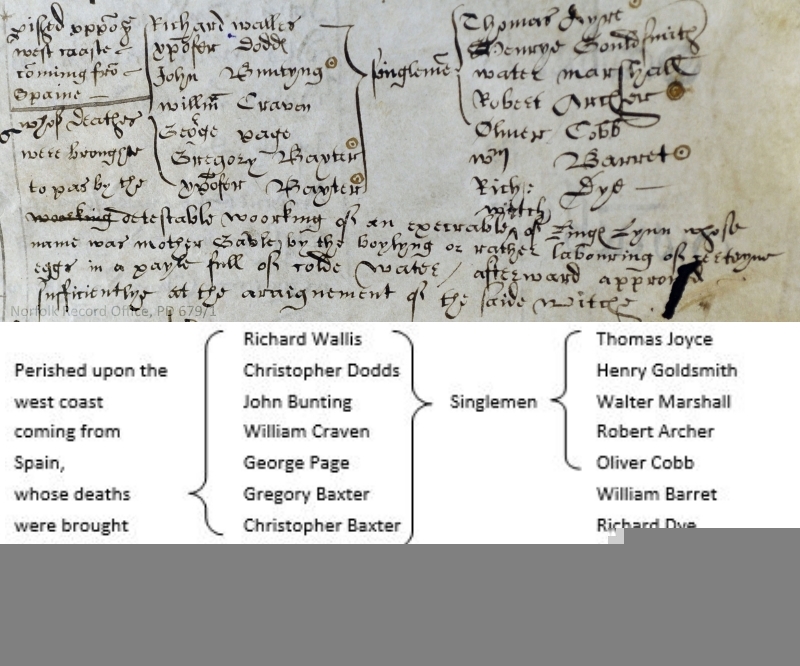 It records deaths at Sea in December 1583 and attributes them to a witch of King’s Lynn. It is more likely, they were caused by a storm. The transcript has converted words to their modern spelling and abbreviations have been extended. Norfolk Record Office, PD 679/1.